An ebook can be either a digitized version of an existing book in print, or a standalone book published in digital format only. They were born out of the meteoric growth and popular use of the internet and world wide web, that allowed people to read books in PDF format online, hence the term ebook. It opened up the publishing world to millions of potential writers as the traditional barrier presented by printing costs was instantly removed. Nowadays, ebooks can be read on both computers and (more conveniently) mobile devices. Although they are often still delivered as “traditional” PDFs, (especially for use on PC or laptop) they are more often delivered via apps on mobile devices, such as the Kindle Fire. Ok. So there is no point trying to write a book about something that you have absolutely no passion for whatsoever. You don’t have to be an expert on the subject but you do have to have something of an interest in it. A hobby, pastime or topic that stimulates your grey matter is often a good choice. Then go out and research the top ten blogs your topic or niche (a simple Google search will throw this up) and read the last 6 months worth of posts on each of them. Similarly, find the leading 3 publications on your chosen subject (just do a search for your topic in Amazon) and read them from front to back. You will now have a better understanding of your chosen subject than 98% of the rest of world’s population and can position yourself as an authority figure. “But I don’t have time to read all those blog posts and books! My life is just so busy!” Do you want to write your first ebook or not? Make time! (Or hire ghost writer, minimum $1500). So you have done your research and you have all that info in your head that you know need to get down on paper. As is the case with any book, this needs to be done in a structured manner for the final book to be navigable and reader friendly. It will also simplify the process for you. So how to create the initial foundations of your book? Come up with the ten most important questions or problems in your subject or market based on your previous research. Once you have done so in a considered manner, pick the seven strongest. You now have the headings for the chapters of your ebook. You will be effectively answering your own questions. Simples. Add an intro and a summary and we now have a structure to work to. Onwards. Now if you really want to sit down and type out your ebook, be my guest. There is absolutely nothing wrong with that and it is often the best way to get your thoughts down in words in the most considered manner. 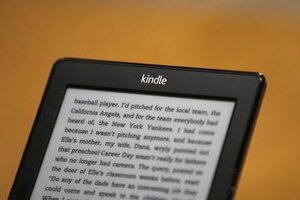 However, if you want to be reading your ebook on the latest Kindle Fire in the quickest time possible, I would recommend the following hack. Simply record yourself answering your questions verbally. It would make sense to refer to notes but this will drastically reduce the amount of time you will have to spend writing or typing. You can then easily find a freelancer online who can transcribe your audio in 48 hours or less for approx $100, well worth the investment. So now that you have all of your content (including any images that can be sourced from online image banks, often royalty free) it is time to hand it over to a freelance designer to put it all together for you in a suitable format. This is something you should definitely outsource. Expect to pay around $200 to have a reasonable job done. This should take no longer than a few days. Once you have your finished ebook you can sign up for a Kindle Direct Publishing Account and launch! You are now officially published!